Camping showers allow you to shower even you are outside. Your trip will be different if you can shower while camping, hiking or padding. You can make this camping shower on your own or You can buy it too. There are several types of ready-made camping showers commercially available in the market. Camping showers are available in a variety of styles, and their price is ranging between ten and several hundred dollars. The options include hot water, pressure or primitive constructions. Camping showers come in a few different styles: solar powered, and propane powered. The first step to determining which is best for you is, understanding the differences between them. 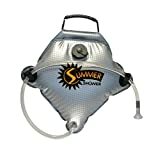 Where the light weight of a solar shower bag may be the best choice for the hiker, the additional size & weight involved with a propane camping shower may be a worthwhile compromise for the car camper. Both styles have their advantages and disadvantages. The solar camping shower bag is the most popular, though not necessarily the best. Solar camping showers are simple bags that use the sun’s energy to heat the water and the earth’s gravity to disperse it. They’re typically very inexpensive and lightweight. They’re a great solution for outdoor activities with strict weight and size restrictions – like hiking, backpacking, and cycling and some of the better camping shower enclosure tents are designed to support them. Their biggest drawbacks with these camping showers are that they can require up to 4 hours of soaking in the sun to warm the water and due to their simple design, many low-quality models on the market are inexpensive but do not last more than a few uses. This shower bag home 5-gallon water which you can for multiple time to showers. This is bag use solar energy to heat water. 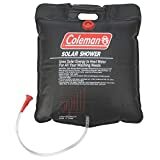 Coleman bag had one strong handle for reliable hanging and carrying.It’s constructed of a heating material which will warm the water in the sun, even on cool days. Great for camping trips and during emergencies when hot water isn’t available. 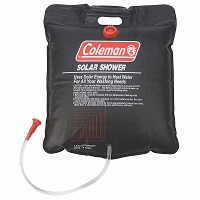 The Coleman 5-Gallon PVC Camp Shower has a great feature where it uses solar energy to heat the water. It also includes a strong handle for easy hanging and carrying. 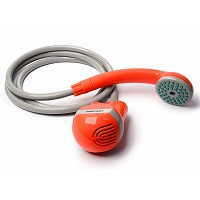 It’s flexible shower hose with handy on/off valve makes showering a breeze. You can give this a try on your next trip! 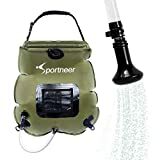 This is one of the tops selling Camping showers on Amazon for hiking, hunting, fishing, and other outdoor adventures. This shower bag could hold up to 3-gallon 5-gallon and 2.5-gallon water and it is designed in such way to it could heat water fast from sun light. It has full carrying handles and Velcro straps for soap and shampoo. The extra-large filling valve features a twist-off cap, and the wide, rubber handle make the shower easy to carry.You can roll up for easy storage. Seattle Sports Solar Shower built with eco-friendlier PVC Free materials. You can ask it in the warm water and ecological peace of mind. This is because it is built with materials that: are chlorine free, Azo Free, Cause no dioxin, heavy metal or pollution in production. For safety and environment-friendly, you must choose Seattle Sports Solar Shower. 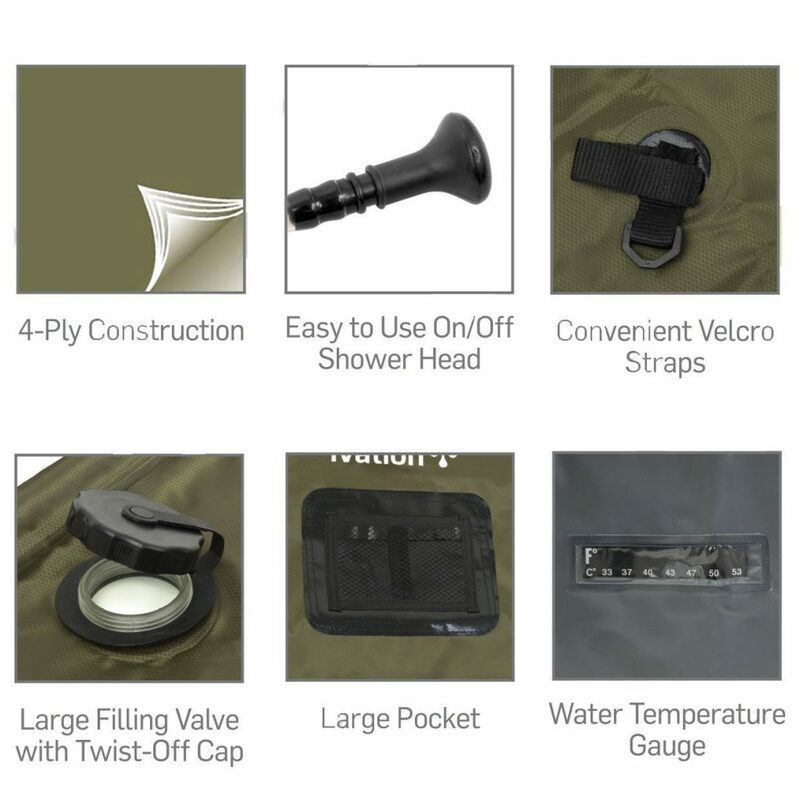 Ivation is a lightweight and easily Portable outdoor shower bag which includes removable the hose w/On-Off Switchable.It is constructed with high-frequency bonding Technology through which Ivation ensure watertight Seal. It is very Soft, Flexible, Pliable & Easy to Manipulate even in Freezing Weather. 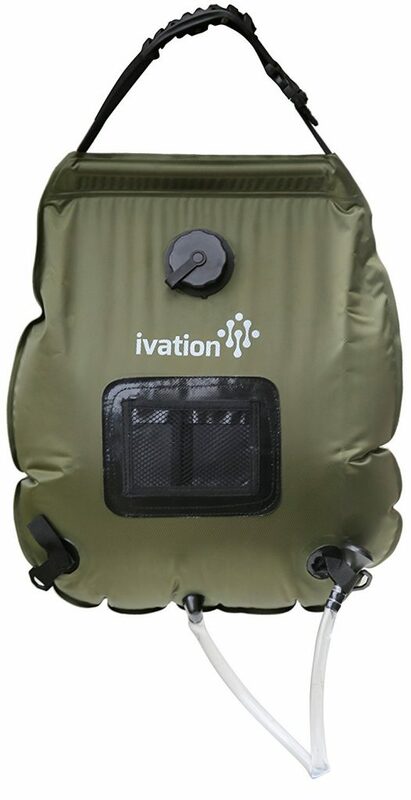 Ivation shower bag is specially designed for camping and hunting and fishing for shower/washing station on the go. 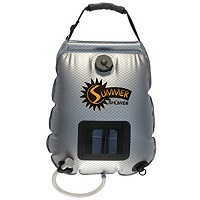 It is easy to use just fill this bag and hang it in the sun for 2-3 hours; the water warms up. Now you can take a shower with hot water. For the ultimate campsite convenience and comfort, propane camping showers are the preferred choice. Portable propane camping showers use propane to heat the water (instantly in many models) and battery powered water pumps for water pressure. These are a great option when size & weight restrictions are not an issue are the most common type of car camping and base camps. They work exceptionally well with all camping shower enclosure tents because the enclosure does not have to support the weight of a heavy shower bag. Instead, you just hang the shower head & hose, and the water is pumped from an external container outside the tent (like a bucket). The drawbacks to the portable propane shower option are that they weigh more and rely on fuel canisters and batteries and tend to be a little more expensive than solar camping shower bag options. Camp Chef Water Heater is made of Steel. It could make 1.5 gallons per minute hot water on demand. The user has full control on setting they can adjust heat and water flow as per their wish. It has its self-stand or uses included brackets to hang. 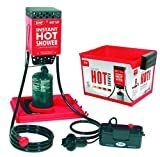 Zodi Hot Tap Propane Camping Showers are among the best camping hot water producers for the outdoors. Showering with freezing lake or river water in cold camping conditions is a very unappealing prospect. A good hot shower with hot water at the end of a day in a cold campsite is a luxury. With Zodi Hot Tap Propane Camping Showers, you can enjoy this luxury. 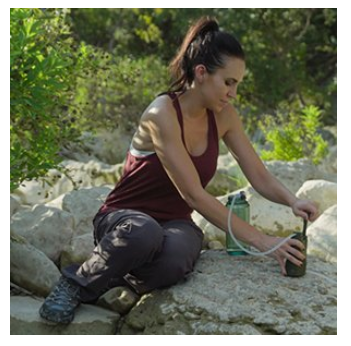 Clean up anywhere outside with battery operated camping showers. Every day we look for new ways to make our lives more enjoyable by finding easier ways to do things – it’s human nature. Having a battery operated camping showers at your disposal will certainly save you clean up time and allow you to get back to the more enjoyable activities quicker. Ivation Outdoor Shower is rechargeable battery camping shower which will make the very comfortable outdoor shower. It has a Compact Handheld take it in your and put the pump in water it will start showerhead, and you will start enjoy. Best indoor and outdoor hand shower with powerful battery easy on off Switch. Nemo shower main feather thing is its foot pump system through which you can pressure in the bag for constant water. You did not need any battery to pump water. Nemo shower has 11 liter tank with the spray nozzle. Now you can convert any 1 or 2 Liter Bottles in the shower. This Including Platypus Collapsible Bottles & Bladders. It is very lightweight only 2oz which will make you very easy to carry anywhere. Great For Washing Pets & Sandy Beach Toys. A typical after-thought is the camping shower enclosure. Where using camping showers for rinsing off at the beach in your bathing suit may not require a privacy tent – stripping down to your birthday suit in the wide open at the family campground is probably not a good idea. Luckily there are plenty of excellent camping shower enclosure options available. They range from temporary, instant-pop-up camping shower tents, to durable, high-quality camping shower enclosure designs that are made to stand-up to Mother Nature’s fiercest weather. Things to consider while shopping for the best camping shower enclosure are the following: Is the unit rated to handle the weight of a solar shower bag? Does it come with a removable floor (nobody wants to shower in a mud-puddle)? Ease of setup and tear-down. Texsport Deluxe Camp Shower/Shelter Combo is one of the best shower combos in the market. It has a removable rip-stop polyethylene floor, Rust resistant 3/4 diameter chain-corded steel poles and two no-see-um mesh roof panels that provide superior ventilation. This best quality camp shower combo meets C.P.A.I.-84 specs. For over 40 years, Texsport has been supplying local sporting goods dealer with camping and outdoor recreation equipment. This is a trustworthy brand to buy! Solar camping shower bags in the perfect way to get clean in the outdoors. 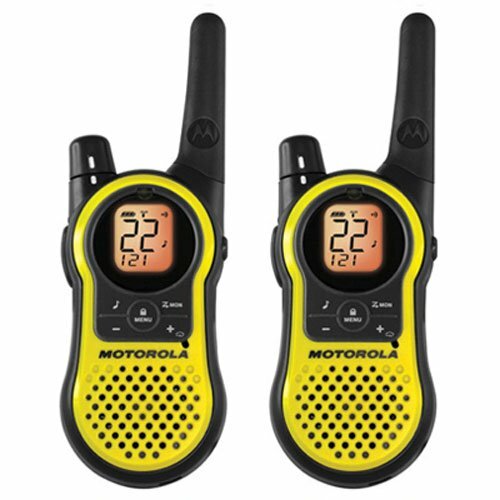 You can take them anywhere: on camping trips, hunting, fishing, boating or any other outdoor activity. Just fill them with water and leave them out under the sun for 3 hours and you can then enjoy a hot shower for up to 5 minutes. There’s only one problem, however: the shower bag has to be hung high enough so that you can stand beneath it. And unless you’re The Hulk it’s not so easy to climb a tree with a 5-gallon shower bag filled to the brim. These things weigh about 45 pounds full. By using the manual pulley system shown in the videos, it’s a lot more realistic to hang a shower bag, even for one person, although you will still be using a bit of muscle to lift it up. For two people it’s not too difficult and a real solution to hanging a full solar shower bag. But if you’re one person, you’re gonna need some mechanical help, unless again, you are the Hulk. A few tips: it’s crucial to use a solid rope such as one made of polypropylene and to make sure that the stake is planted firmly into the ground. Also, make sure to test the solidity before standing underneath the bag. An alternative to using a stake is to tie that end of the rope to another tree close by. I recommend doing that if possible because the stake might not be planted firmly enough into the ground depending on the soil conditions. Step 1: Attach the pipes to the three-way connectors. Doing so will create your showers’ tops and bases. Step 2: The next thing that you must make is the sides of the camp showers. To finish the task, you must use your five feet PVC pipes. You can now see that the frames of your camp showers are formed. Step 3: Wrap the frames with plastic tarps. Step 4: With the use of the tie backs, attach the shower’s frames to the plastic tarps. After these steps are accomplished, your outdoor camping showers are now ready to use. You might be wondering if you can create a camp shower that is capable of providing heated water. This is possible. You can make a one that can provide warm water and another that produces cold water. Making these two types of camping showers is not difficult to do as long as you have all the necessary materials and follow the steps in creating them. Let us first learn how to make a cold water outdoor camping shower. The materials that you will need are the following; sturdy rubber bands, medical tubing that is made of rubber, knife, rope and a spray bottle which has a 1-gallon capacity. The first step that you need to follow in making a cold water camping shower is to get a knife. Look for the hose that is connected to the bottle and cut it using your sharp knife. After that, search for the other end of the hose. You will find that is connected to the spray nozzle. Use your knife and cut it as well. The purpose of cutting the hose is that the rubber medical tubing will be the one to take its place. Get your rubber bands and use them to wrap the parts at the location that the rubber medical tubing was attached. Now, put some water in the bottle using the pump. Always check for leaks in the connections to prevent the water from escaping. After you can learn how cold water camping showers are made, it is time for you to learn how to make one that is capable of providing warm water. All the steps are just almost the same. The only difference is that warm water camping showers need the sun’s heat to be able to produce heated water. You can achieve warm water by using a stove. Get your bottle and store the warm water there. Just follow the steps mentioned earlier in creating a cold water camping shower, and the result will be a warm water camping shower. Creating your camp showers isn’t hard to do with these easy to follow steps. Learning how to make your own camping devices can be very beneficial because not only are you able to add something to your knowledge but you can also save a lot of money. Going into the wild, which means the backcountry for some, the pay campground for others, is a fun and exhilarating adventure. In the great outdoors, we can reconnect with nature, take in the fresh air and beautiful scenery, and drop the burdens of town and city life. If we’re doing things right, we can end up getting pretty dirty on the more adventurous outings into the wild- it’s nature’s dirt and can be considered cleaner than factory dirt. However, we will still want to get cleaned off. If we’re lucky enough to be by a clear flowing stream, we may be able to use that avenue to get the job done. If, however, we have to rely on our means, then we will need a camping shower. This guide will introduce some of the products out there that feature different uses and will be better suited for some purposes than others. It will also tell readers about an easy, free way to “shower” while camping- and fear not, it doesn’t involve a trick like licking yourself clean or anything like that. Read on to find how you can stay clean even when the nearest normal shower is miles and miles away. For the purpose of making things easy for the two extremes that campers fall in, this article will divide camp showers into two categories- those for luxury camping (aka car camping, where you don’t really have to worry about weight and those camping showers for backpackers who absolutely must be weight conscious if they are to enjoy their trip into nature. Although you could get away with using the label “portable camping shower” with all these products, they vary greatly regarding portability. Luxury campers make a choice to bring as many of the comforts of home as possible with them. Why go camping at all, you say? Well, people do have the choice to go into nature and NOT rough it. Perhaps you could consider it something like an outdoor hotel room (although sleeping will still usually be done in tents). 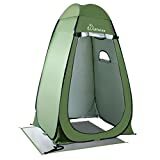 This type of camper can afford the weight of any camp showers, whether it be the bladder kind that’s heated by the sun or propane fired models like the Zodi Hot Camp Shower which weighs in at 8 pounds (not including shower water, of course). Luxury campers also can and often do bring along a camping shower enclosure as well. Although lugging along an 8-pound shower would be unthinkable to even semi-serious lightweight backpackers, the Zodi is a very good design that more than carries its weight regarding what it can do. 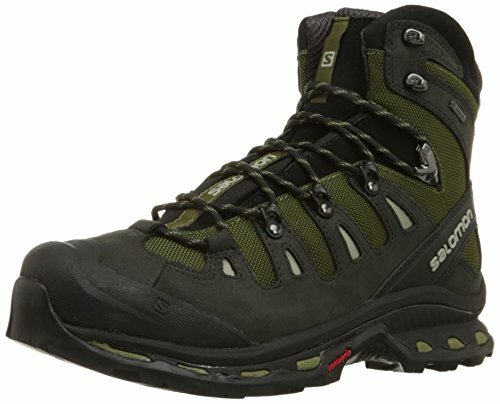 It heats an unlimited amount of water using its propane and battery sources (which are not unlimited, of course) and the manufacturers claim it is only about the size of a hiking boot. 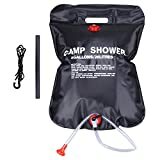 I’d have to say that this would be something to bring on a short camping trip intended to introduce non-outdoorsy friends and family to camping, as these camp showers will probably go a long way to making them feel comfortable and don’t rely on the sun on to warm up water. For those who will have a car with them or will be doing a lot of driving to and from campsites, there are also camping showers that use your car’s cooling system to warm up shower water. This type of outdoor camping shower hooks right up to your car with the hood open. Most people don’t want to see their family members naked, so luxury campers may also want to get a camping shower tent for privacy. Serious backpackers often don’t pack any shower, relying instead on natural bodies of water to get clean or perhaps do a sponge bath type cleaning session. This is very simple and the best way to get clean if you don’t want to pack a dedicated shower. All that’s necessary is to heat up some water (unless it’s hot out and you don’t need a warm shower), then put it in some basin- you could use a camping pot. Then, put a little bit of biodegradable soap into the pot and use a bandanna to dip into the water and wipe yourself off. It might sound a little strange, but a bandanna, a container of warm water, and some Dr. Bronner’s soap can make you feel as clean as any shower. Besides, you’re in nature; it’s okay not to scrub yourself surgically clean. If backpackers do bring a shower, it will almost invariably of the solar camping shower variety. These are bags that, when filled with water and hung from a tree branch, heat up in the sun and provide hot water showers. The key here is that you are dependent on the sun- if there is no sun, there will be no hot water. If the sun is strong, the water can get hot enough to scald. These types of portable showers for camping may require some planning and familiarity (or just luck) to get to work for you. For many of us, going to sleep without taking a shower is just not an option after a day of sweating it out; but unfortunately, it’s often what happens when going camping. If you’ve been spending the day outside, under a hot sun, the dried out sweat on your skin coming in contact with the covers when lying in bed at night is an unpleasant feeling. I’m sure all of you are reading this have had this experience at one time or another. It’s just much more comfortable to go to bed having that refreshed, clean feeling. Many campgrounds do have public showers, but the lack of privacy and cleanliness can discourage many of us from considering that option. Even those of us who decide to use a public shower is far from having a sensation of bliss at the thought of using them. It can make your camping experience more uncomfortable than it should be. Fortunately, nowadays there is a better option, and it’s called a portable camp shower. It consists of a shower tent and a shower bag. These lightest camping showers are usually equipped with a solar shower bag; meaning they rely on the sun to heat the water inside as opposed to relying on energy produced by heavier equipment such as gas-powered heating. Some models are even light enough to be carried around when backpacking. The gas-powered models are usually more suitable for car camping due to their weight, and although the solar-powered solution is the lighter of the two, it seriously lacks the efficiency of a gas-powered model that can easily provide hot water on demand within seconds. As a comparison, it can take up to 2-3 hours for water to become warm in a 5-gallon shower bag under full sun. Considering the different camp shower options available on the market, there are no excuses to go without a shower when hiking, camping, fishing or whatever outdoor activity you enjoy. There are numerous brands to choose from in retail stores on the Internet, so you’re sure to find a solution that fits your needs. If budget and weight are not an issue, a gas-powered camp shower is a way to go, but if your main concern is cost and portability, a solar-powered camping shower will do just fine on sunny days. That’s right; portable camping showers do exist even though it’s not the typical item that campers are usually looking for when browsing their local camping store. Remember the last time you went camping for more than 2 days with no accessible showers and couldn’t stop thinking about how nice it would feel to get back home to a nice warm shower? For some people, this feeling of uncleanliness can turn a fun camping weekend into a negative experience. Well, with your camping shower you can say goodbye to the unpleasant feeling of being sticky all over after a weekend of camping. Sure, you can find a public camping shower on some campgrounds, but we all loathe the idea of going in there knowing how gross it is. I, for one, instinctively start tip-toeing the minute I get in there so that my feet don’t fully get in contact with that vile and dirty public showers floor. On top of that, you do need to get up pretty early before the others if you want to have enough hot water. Nowadays, everyone can go camping without the lack of hygiene and comfort usually associated with camping. Go ahead, get one of the available camping shower solutions on the market and add it to your camping gear. You won’t be disappointed, and you will feel fresher for the day ahead. Note that you can also use a portable camping shower for fishing, hunting, sailing, at the beach or any other outdoor activity you can think of. Once you’ve decided on the right style, it’s time to narrow-down to the best camping showers and models for your needs and your budget! Look at user reviews for any particular model you are considering as these can be valuable sources of insight. While it is important to keep an open mind when reading camping shower reviews by users, you must also remember that the authors of the reviews could be affiliated with certain brands and therefore biased. Use reviews as a guide but don’t follow them blindly. Research about the best camping showers they recommend so that you can get a feel for every product.